Meet Chama, an activist for the indigenous people of North Africa and a visual artist who is passionate about the intersection of arts and politics. Her work has been displayed several times in the United States, Germany, and Morocco. Her last exhibit took place at Boston University for which she designed the 2016-2017 visual identity of the Elie Wiesel Center. She has been invited to speak about women and minorities in North Africa at numerous venues including the Boston Museum of Fine Arts, the American Islamic Congress, and the Center for Jewish History in New York. I always make sure I'm wearing at least one thing that represents some aspect of my identity either Amazigh, African, Mediterranean, Muslim, or Jewish depending on what I want to highlight at that moment and whom I will be speaking to. Frankly, I like to confuse people a bit about my identity, so that they can't quite box me and categorize me however they want. I also embrace what I call a pluralistic inner-self, which allows for multiple identities, some of which may seem conflicting with each other, to exist and flourish equally within one's self. Generally if you're an activist, you have to be conscious of who your audience is and what kind of impact you want to have on them. So, it's important to put some thought into how you present yourself to the world. How do you reconcile (we're using this word loosely!) your dual identity and navigate through the different communities you belong to? I belong to a certain degree to some clashing identities; Indigenous Amazigh, African and Arab, Muslim and Jewish, all at the same time. These identities not only make me who I am, but also make Morocco what it is today. While I deconstruct all of those identities, I don't necessarily think of them as different from each other. It's quite simple: I can be both Muslim and Jewish, Arab and Amazigh at the same time because there are so many similarities between both religions and cultures. So instead of limiting myself to identifying with one single identity, I consciously choose to reflect the history of Morocco by the simple act of identifying. Of course, I'm always talking more about Jewish and Amazigh identity and history in North Africa more than other identities because both are largely underrepresented in our history textbooks and are culturally marginalized in the context of contemporary Morocco. In terms of reconciliation, let me share a story with you: I was a sophomore at Brandeis University when an Israeli friend of mine approached me saying, "how do you do it Chama? You are friends with everyone: Jews, Muslims, Christians..." - he was commenting on my interaction with a hijabi Arab-American friend right before he showed up. So I told him that I grew up in a country where Muslims and Jews lived together and helped each other, and I refuse to live any other way. How are faith/religious pluralism and diversity, and womanhood intertwined in your artwork? For the last 8 years, I have been focusing on women who hold a triple minority status: they are women in a gendered society, Amazigh in an Arab state that marginalizes their culture and language, and finally, Jewish in a Muslim country. I spent a long time researching and painting women who lived at this intersection of multiple identities and whose status caused them a great deal of marginalization, oppression, and nonrecognition. When you look at both my abstract and figurative paintings, you'll see many indigenous symbols signifying womanhood, fertility, resilience, and strength. You can also see elements from both Amazigh and Jewish cultures and languages. Right now, I'm working on a series of photographs exploring the relationship between faith and women's bodies across the Mediterranean. I'm sort of moving away from my past work to experiment with multimedia works on the complexity of women's experiences in the Mediterranean and the wide diversity in manifestations of faith and spirituality. I'm also asking questions like, can women be empowered by religious text that gets interpreted in oppressive ways? Is it time to revisit and reform all religions for the sake of advancing women's rights and protecting their bodies? Can a woman's body be freed without being sexualized or exoticized? 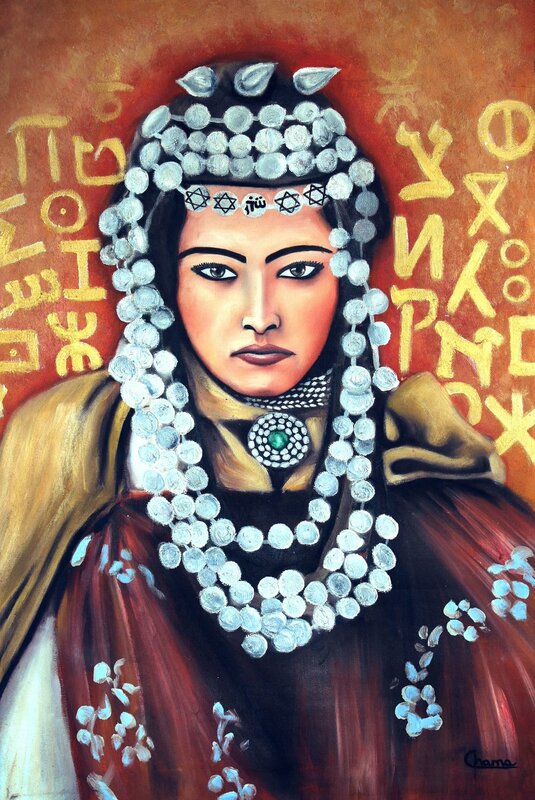 Indigenous Amazigh women are responsible for some of the best art that you see coming from Morocco. They have given so much to North African culture as we know it today, yet remain unrecognized. They were artists and artisans, poets, healers, musicians, performers, and warriors. So when you sit comfortably in your living room contemplating that fashionable "Berber" rug you have, you should know that it was originally designed by an Amazigh woman before Ikea mass produced it. When you eat couscous or shakshuka, you should recognize that it was created by an Amazigh woman. Amazigh women also fought wars against not only French and Spanish colonialism, but also against the 7th century Arab conquest. So reducing these amazing women to a few orientalist photographs and paintings, almost as if they are extinct species, bothers me deeply. You can help by passing on this information, so that we can all give indigenous people the recognition they deserve. Indigenous people are not barbarians and savages, they are great civilizations that our wealth-driven and power-hungry society is destroying.